Fashions of Time: Rockin the Regency! Ok... So I have been super busy. Sewing and looking at everything I need to pack. Me and the hubby are building a house and it will be finished in a 1 1/2 weeks!!! The DFW Costumer's Guild is having it's summer tea party in the 19th century. 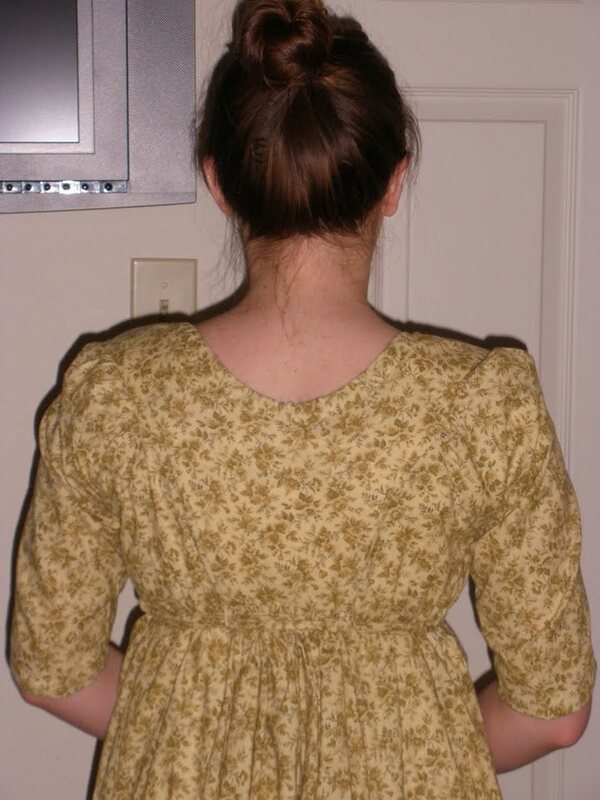 Quite a few of us are going regency. 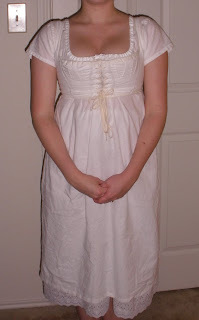 I decided due to time constraints I would go with a simple day dress. PLUS the hubs is going with so I need to make his outfit!!!!! 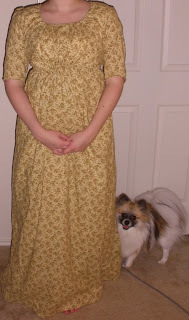 I used the Sense and Sensibility pattern's for the Underthings and Drawstring Dress. I am very proud to say that most is stitched by hand!!!! 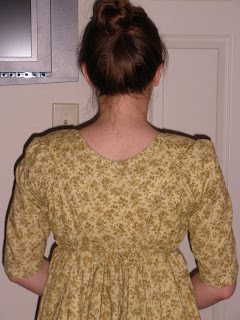 I did the inside seams of course with the machine but anything visible I did by hand....errr except the short stays. I did them as practice but when I was finished I realized ...yyyaaa I may not have time to do it ALL by hand. So that will be a project later. I super love the short stays though. They are really comfy and give me good posture. I was really nervous half way through that they wouldn't fit right but I am satisfied with the way they turned out. I ended up making the top a drawstring as well as the bottom *makes me feel a bit more secure. * LOVEEEE the chemise...in fact I slept in it last night...its light and cool for this 100 degree summer we are starting to have. I bought a spencer jacket pattern that should be on its way but I may end up drafting something from Costume in Detail. I would like to document that if possible. Plus the bonnet. I am first going to work on the bonnet that way I have a pretty complete look but really want the spencer jacket as well. The husband will have a cut away tailcoat of brown velvet (which my spencer will match). And he is opting for long fall front trousers and we need to find suitable boots. Any suggestions for decent priced reproductions that can get here in two weeks? Your dress is absolutely adorable! We are going to have so much fun at the tea!